For a century, pork roll in New Jersey has gone by one name, despite competitors: John Taylor. Our beloved “Taylor Ham,” or pork roll, we can argue about what it’s actually called, but let’s agree that our unofficial state Mystery Meat is delicious. The spice recipe is a well-guarded secret, and because it is a type of sausage, we know not to look too closely as to how it is made. So I’ve drastically cut down my consumption, as processed food products, especially those with nitrites, have become a health concern. Well now there’s a grass-fed, pasture raised and antibiotic-free contender in the ring, from Vincenza meats. Available in New Jersey at Whole Foods, in the deli, I first learned of them in a Saturday Star-Ledger article, and immediately walked up Bloomfield Avenue to my local Whole Paycheck. I had to scour the store; it’s not packaged, it is a deli item. 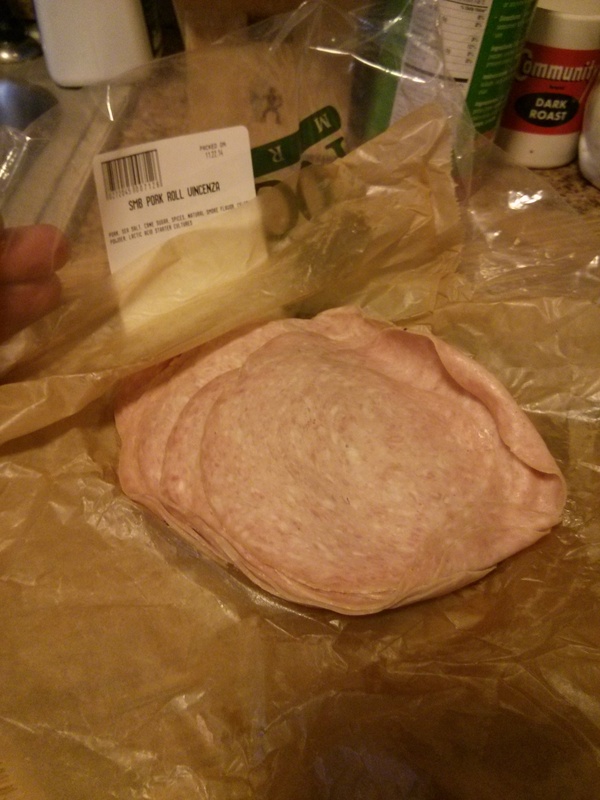 I ordered mine a little thin because I like mine crispy, but forgot this is “deli thin” so normal thicker slices might have been better to mimic the packaged pork roll slices. They cook up nicely in a little butter. They have enough fat to not need butter, but why not? I didn’t slice the edges to keep them flat, because I thought they’d fry more like salami, but they still puffed up like the classic. You can see the spices once they start cooking.I let the edges get crisp and then flipped them, and because I don’t have rolls, I simply fried up some tomatoes and eggs to go with. The taste? 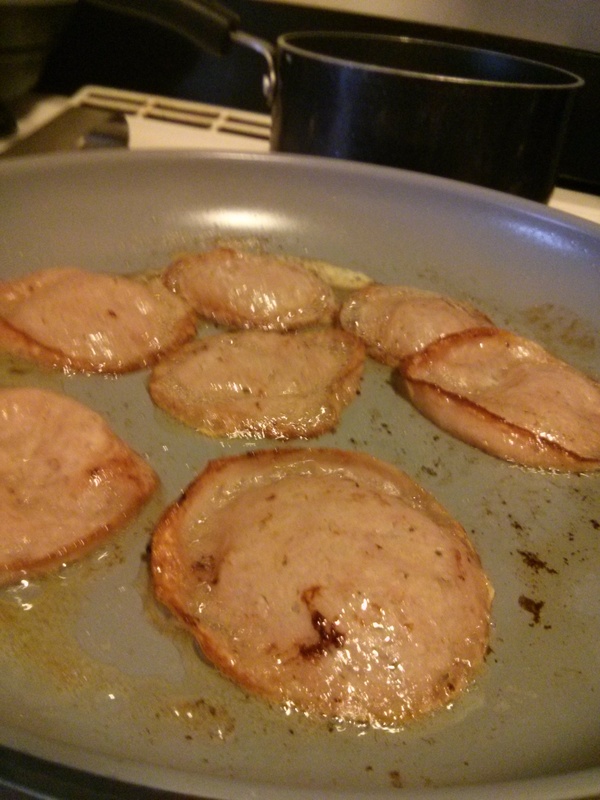 Like good pork roll. 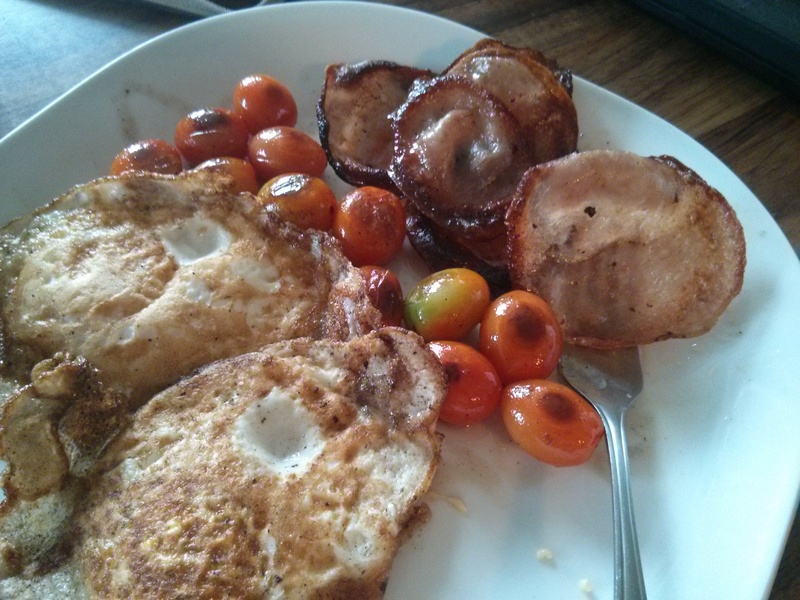 Nothing unique or different, which was the idea- to make it taste like classic Jersey pork roll. It has some tang to it, thanks to the fermentation, and the article states they put a little port wine in the mix, but it doesn’t taste fancified. So, if you’ve been looking for a pork roll made from humanely raised pigs, Vincenza pork roll will satisfy your conscience. At $14.99 a pound (versus $7.49 for John Taylor pork roll) it’s twice the price, for about the same taste. I haven’t been able to verify the ingredients, if he adds nitrates, whether from celery juice or not. Next time I’ll do a side by side test with kaiser rolls and Land O’ Lakes American cheese.